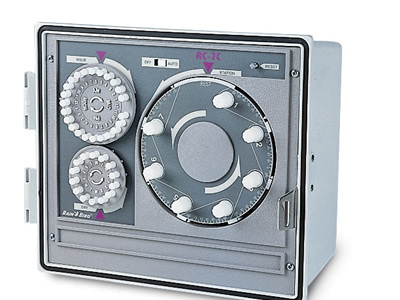 The technology for controllers has made significant advances in the past several years. Newer controllers offer a variety of features nonexistent in older models. Here is a sample of money and time saving options that these controllers provide. Precise Watering Times – The ESP controller allows you precise watering times. If you set a zone to run 13 minutes, it will run for 13 minutes. With the electromechanical controllers you can’t even choose 13 minutes, it’s your best guess. If you set the electromechanical timer for 10 minutes it might run 7 minutes, it might run 12 minutes. It’s hard to put down just the right amount of water like that. 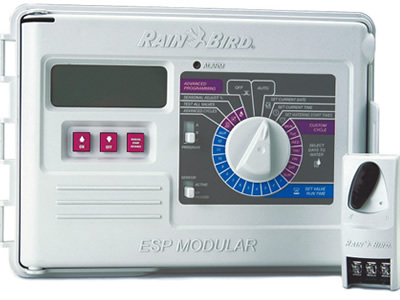 Rain and Moisture Sensor Compatible – With the ESP controller, you can have a rain sensor or a moisture sensor to help manage your water usage. You can not have either on the electromechanical. Multiple Programs Allowed – If you want to water your lawn every other day and water the planting beds on Monday and Thursday, you can with an ESP controller. With the electromechanical you can’t even come close. What the lawn does, the planting beds do. Seasonal Adjust – As the weather changes with the season, you can simply change what your system is doing on a % basis. The seasonal adjust feature allows you to increase or decrease the watering times of every zone on the controller simultaneously. One simple change allows you to water longer in the summer heat and less as fall brings our cooler temperatures. These controllers are completely flexible that way. Good luck trying to accomplish the same thing with your electromechanical controller. Backup Battery – If there is a three hour power outage, your ESP controller will retain the program, current date and time information. The next scheduled run will be on time. Your old electromechanical controller will still remember the run times for each zone but it will be running three hours later than it was supposed to, maybe watering the kids headed to the bus stop. Electrical Fault Indicator – If there is an electrical short in the wiring to one of your zones, the ESP will tell you so allowing you to address the problem before there’s any damage to the yard. With an electromechanical controller, you’ll find out about the problem when you notice the dead plants or brown lawn. I could go on. If you’d like to know more give us a call.